While camping a Boss doesn’t sound to hard if you know the actual location of the boss in addition to his spawnframe everything becomes a little bit more difficult if multiple bosses can spawn at the same time. 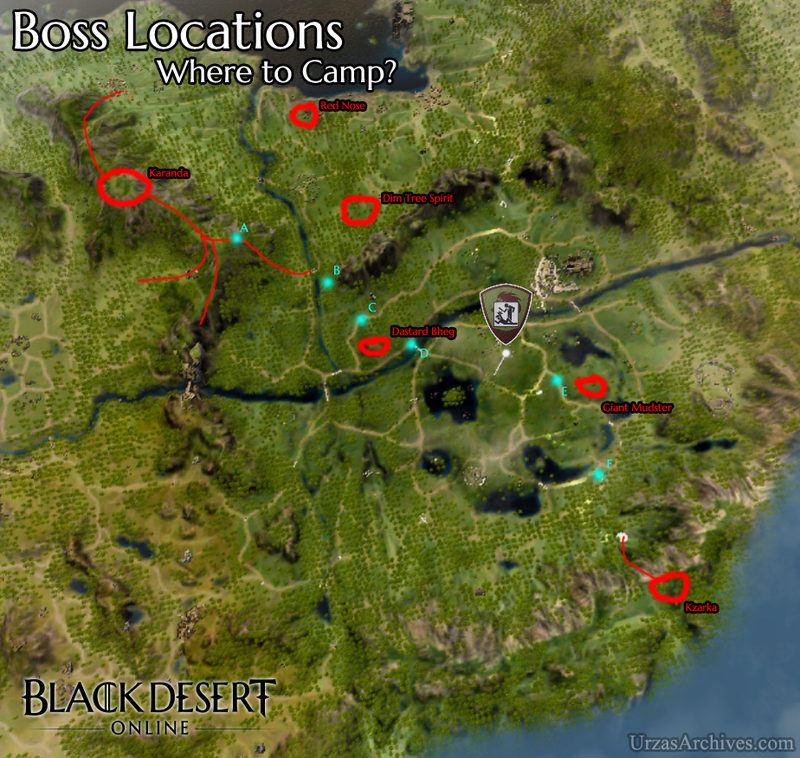 This short guide is showing you some of the most effective spots to camp while waiting in multiple bosses. Please Note: This guide is to max. the possible income from bosses, if you need a specific item e.g. Bheg’s Gloves camping directly at his pond might be the better option for you. This location is basically your go to if Karanda enters her spawnframe but any other Field can spawn. Running downhill will allow you to quickly access Dim Tree Spirit & Dhastard Bheg with a little bit more time to reach Red Nose or Giant Mudster. This location features quick access to Dim Tree Spirit or Dhastard Bheg. You should choose this in case both of them are in their spawnframes. Should Giant Mudster adds himself while you are waiting for Dhastard Bheg and/or Dim Tree Spirit this is your position to camp. This is basically the all round – never wrong – camping position basically all Field & World Bosses can be quickly accessed if you choose this position. While Kzarka is in his spawnframe but there are still some Fields left or they are entering their frames soon – choose this location. This location is recommended on possible Kzarka Spawn in the prime time while other bosses can spawn as well. It will allow a quick access to Kzarka but allowing you to sprint to any other boss with a short delay. I hope those locations will help you to increase your income from those nasty bosses. Good Hunt!